Quebec's Tamil Community is holding a special event on Sunday to recognize their community's contributions to science, culture and society, both in Canada and abroad, as part of Tamil Heritage Month. Canada is home to one of the largest populations of the Tamil diaspora in the world. In 2016, parliament unanimously adopted January as Tamil Heritage Month in 2016. Vinoth Navajeevanantha came to Quebec when he was only two years old with his parents, as a refugee. "There were 150 Tamils in [Canada in] 1983 and now ... we number about 300,000 Tamil people," he said, citing Statistics Canada. The month chosen is significant because Jan. 14 marks the start of Thai Pongal, the harvest festival, celebrated in India and Sri Lanka. It's one of the most important holidays to Tamil people. This linguistic group is found primarily in India and Sri Lanka, but there are Tamil-speaking people in Malaysia, Singapore, where Tamil is an official language, and a few countries in Africa. The largest migration of Tamil people started in the early 1980s, during Sri Lanka's violent civil war, which only ended in 2009. Navajeevanantha is the vice president of the Quebec Tamil Community Centre and organizer of the celebration being held in Laval, Jan. 13. The community will honour a few Tamil-Canadians for their contributions, including a young Montrealer who discovered a bacteria strain that can help clean up oil spills, as well as a Tamil-speaking film and television producer. The free event will also feature traditional and fusion dances. The celebration is very important for Tamil-Canadians, but it's not only to pat themselves on the back. A big part of Sunday's celebration is the food. Because Tamil-Canadians come from different countries in South Asia, their cuisine sometimes gets lost in the shuffle of Indian dishes, such as butter chicken. Make no mistake — their food is as unique as their language. Kathiresu says the food has stronger spice flavours, not necessarily heat, but the overall flavour profile. 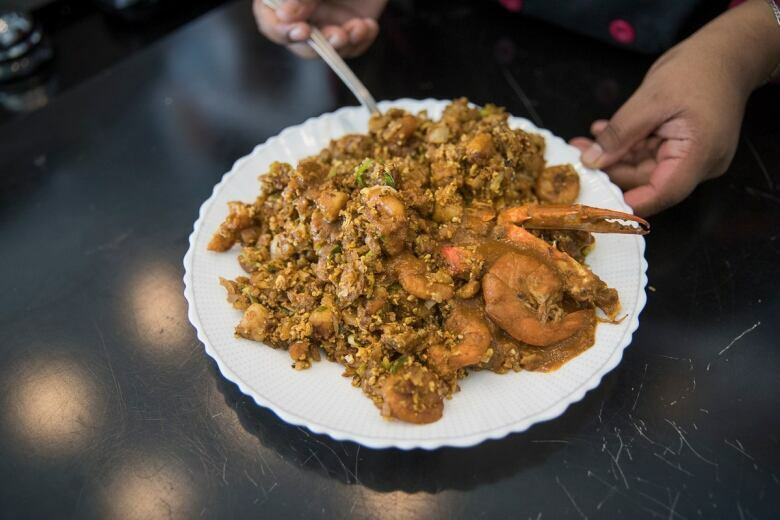 Their dishes feature a lot of rice and coconut as well as curries and lentils. "My favourite food is Idiyappam or string hoppers, steamed rice noodles," a very popular dish in Sri Lanka and South India, she said. Navajeevanantha has been trying out traditional recipes from a cookbook called Handmade which features stories from 34 widows of the war in Sri Lanka. He recommends it for people looking to learn more about the food and history of Tamil people. If there's one signature dish that both of them can agree on, it's Kothu Roti. A popular street or snack food, it consists of flatbread cut into thin strips and mixed with spices and meat or eggs. As for why Tamil-Canadians have become such a tight-knit group with a passion for maintaining their language and culture, Navajeevanantha believes it's because they now have the freedom from persecution to do so in Canada. "Tamils weren't allowed to be Tamil, you know, to give a short short version of the story. And part of it included the burning of the Jaffna public library, which housed a collection of all Tamil artifacts, even written on Palmyra leaves from thousands of years ago," he explained. "Tamils literally left Sri Lanka with the clothes on their backs and their cultural identity. And the ability to live in Canada and add to this cultural mosaic is what makes us proud to be Tamil-Canadians." Kathiresu said the willingness for many Tamil refugees and immigrants to contribute to Canadian society is a part of who they are as well. "There's a really nice Tamil saying that says 'Whatever town I am, everyone is my kin.'" The celebration for Tamil Heritage Month takes place Jan. 13 at Chateau Royal in Laval, 3500 Boulevard du Souvenir, from 11 a.m. to 3 p.m.